There are several pictures in this tome that will look a lot better if you click on the photo to view it in a larger format. Off we went to Atlanta, Georgia, via Southwest Airlines on September 24, 2012. Who knew they flew nonstop across the entire country? We enjoyed the flight with lots of legroom and not having to pay extra for it. 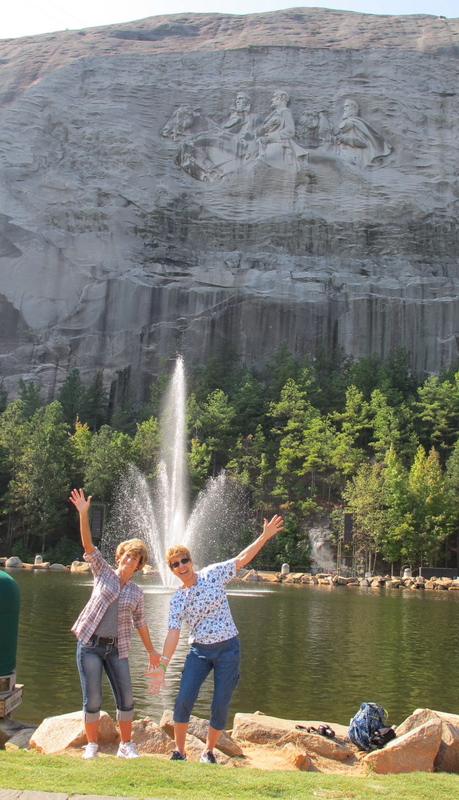 Stone Mountain is bowl shaped rather than craggy snd is very distincting from a distance. around a bit and saw not only the sculpture, but lakes, a covered bridge, a museum and lots of friendly people taking their daily constitutional. 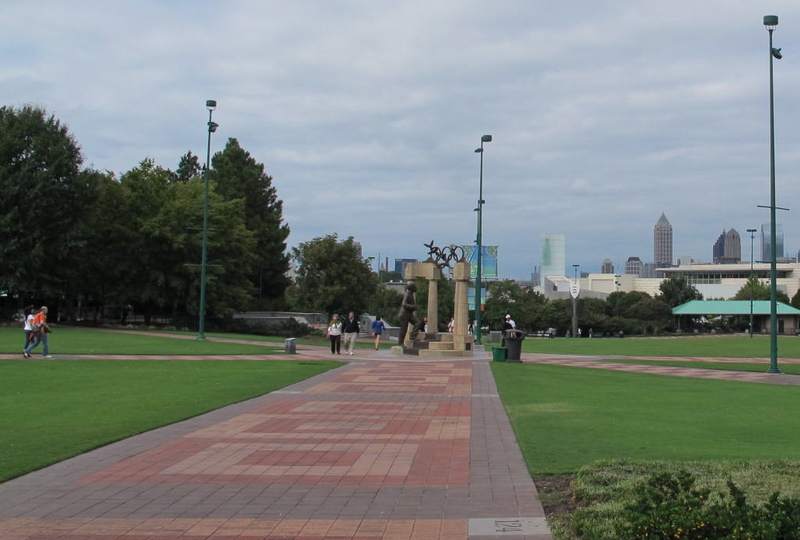 Lots of people enjoy Georgia’s outdoor areas in which to exercise. An aside here. I found Georgia’s people to be extremely friendly and extraordinarily polite. Nobody calls me ma’am in California and that was the standard in Georgia. It was very refreshing and unexpected. After satisfying our Confederate Memorial curiosity, we drove on south to Macon near the geographic center of Georgia. It was also Georgia’s capital during the last two years of the Civil War. A couple of things struck me as we zoomed down I-75. One is how green Georgia is with what seems like jillions of trees lining all the roads. They make the state so beautiful. We seemed to pass many lakes, large and small, on the trip. We just don’t see that in Southern California. Another point is the number of counties in Georgia. We seemed to pass through one about every 5 minutes and Jerri had warned me about this fact. Come to find out, Georgia has 159 counties! There is a lot of history involved with this big number, which I won’t go into here. I just hope Georgia’s students don’t have to memorize all of the counties! I really liked Macon. 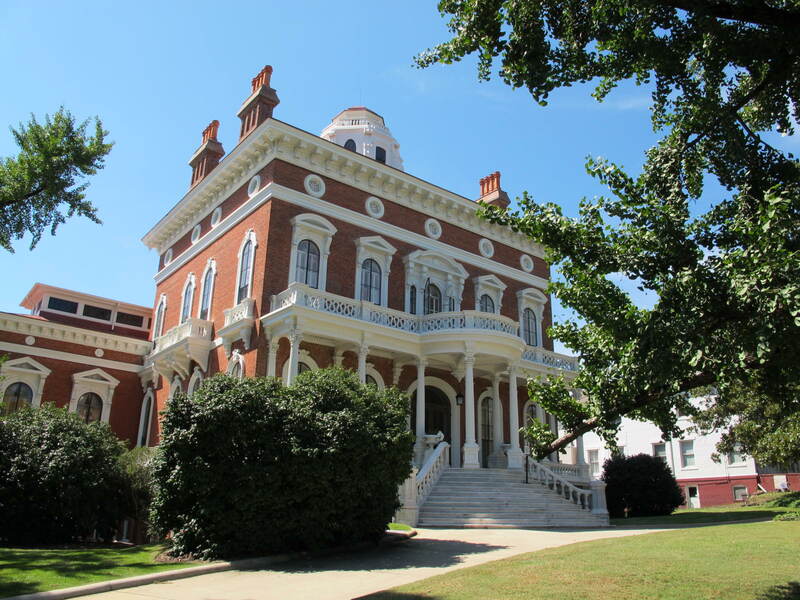 It’s a pretty town set next to the Ocmulgee River (pronounced with a soft g) with many beautiful antebellum mansions. The people were very friendly and spoke with a bit more southern accent than did folks in Atlanta. Jerri told me it would be much more pronounced as we moved south and east. She was right. 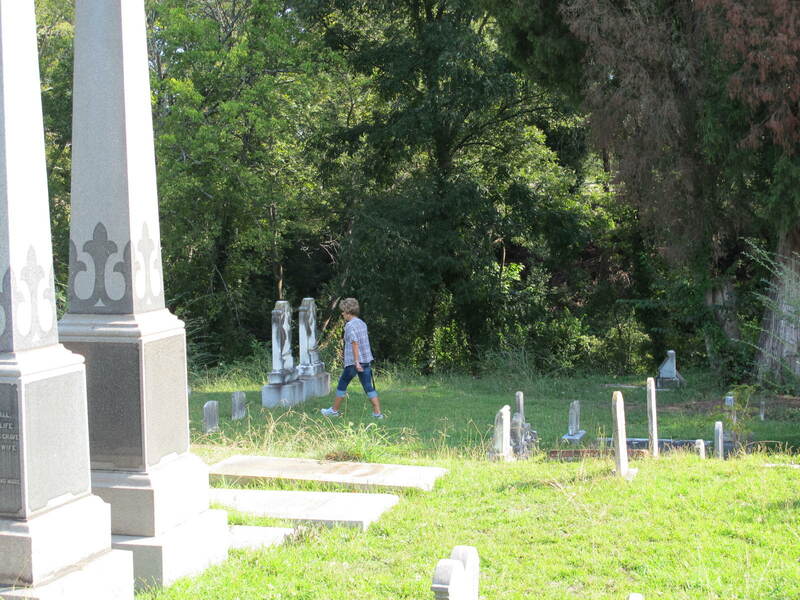 Jerri loves visiting cemeteries and we went to two in Macon…the Riverside and Rose Hill. Both of these places dated from just before The War and are still being used, although Rose Hill was very unkempt and spooky. Civil War soldiers as well as Duane Allman and Berry Oakley (rock and roll stars) are buried here. remains in the Southeast. People were known to have lived in the area from around 10,000 B.C. through the early 19th century. 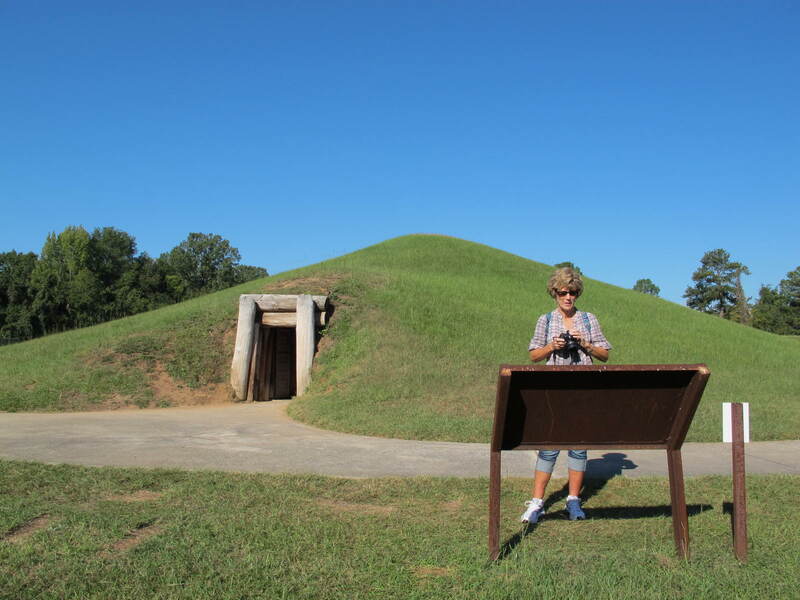 Over 700 acres have been preserved in this monument and one can walk on trails to visit a reconstructed earth lodge, other large mounds, as well as where some Civil War skirmishes were fought…although only one Macon house was damaged by cannonball fire during the war. Judge Asa Holt, well to do plantation owner, it housed meeting parlors for the Alpha Delta Pi and Phi Mu societies, which were founded in Macon. We didn’t get to tour the Hay House, but took pictures of it. What a mansion! It was built in 1855-59 a la Italian Renaissance Revival and sported 24 rooms as well as a plumbing system with hot and cold running water in several INDOOR bathrooms! I wish we could have seen this interesting place. But here is a picture of the entrance. We were told this house had 8 stories. We could only figure out 7. But what the Hay, let them decide what is a story. Jerri discovered several streets lined with these beautiful mansions and we took pictures of many of them, but alas, tours were not available for most of them. They are still regular houses and are being used in every day life. It just took a couple of hours to drive to Savannah but we could begin to see a bit of a change in the climate…such as Spanish moss hanging from the trees. Savannah is located beside the navigable Savannah River (Our hotel was less than 50 yards from the river and a container ship blew its horn about 1 AM one night and sounded like it was in bed with us!) and was founded by General James Oglethorpe in 1733, the last English colony. Historical monument. Jerri worked here in ’72 and ’73! Jerri and Allan lived in the Savannah area while he was in the military in 1972-3 and she was excited to see where she worked and show me the places they lived. We found her work place, which is now abandoned and since it’s in the historic district probably going to be redeveloped for something historic. It is apparent that the phone company does not operate it anymore. She worked on the 3rd floor and then moved to the 2nd floor. When we went to find their homes, it was as if they’d fallen off the face of the earth. Roads were widened, addresses changed, landmarks changed and they just weren’t there. Stuff happens in 40 years! 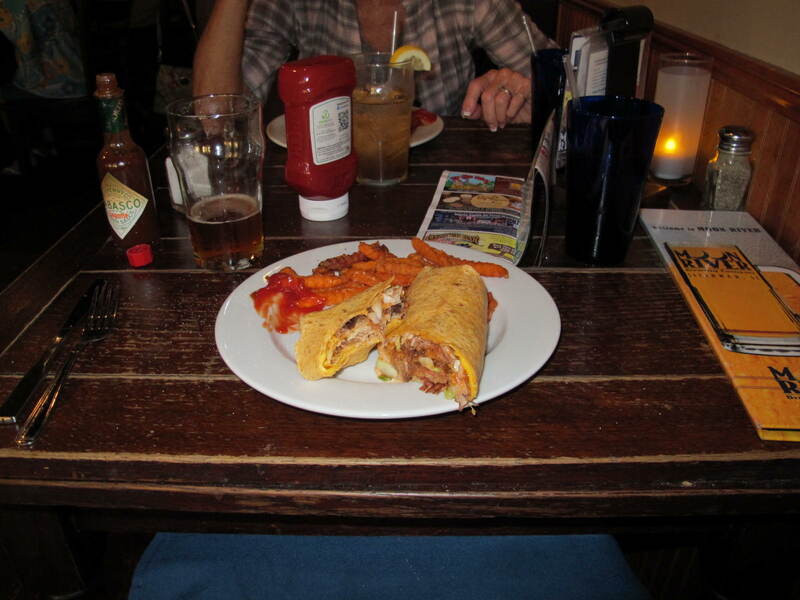 Good grub at the Moon River Brewery! fries were the side dish. Yum! What a feast it was! We wished that we’d split one as neither one of us could finish it. Pubs or neighborhood diners are our favorites as they tend to have really good food for good prices plus the service people tend to be friendlier. 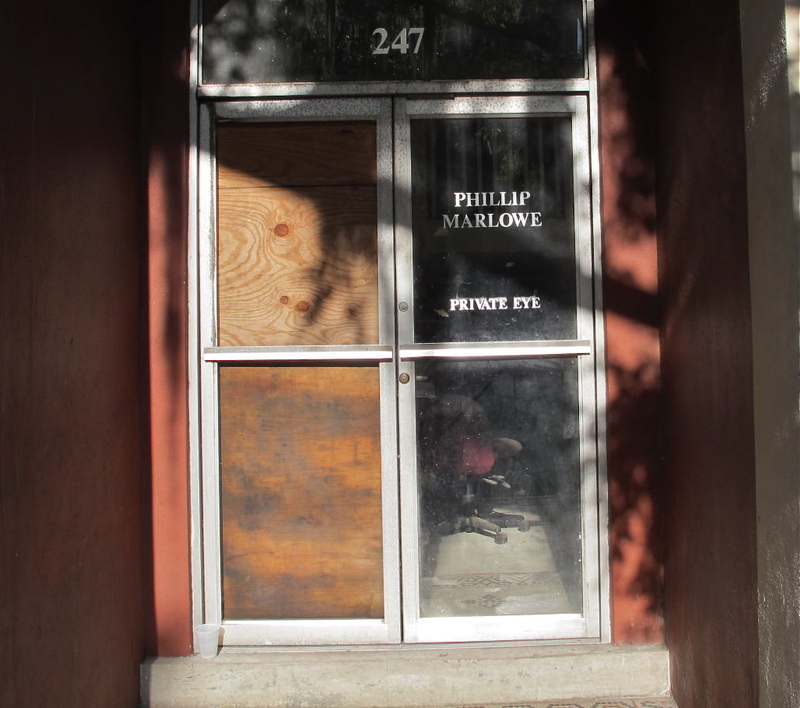 We discovered a branch office for Phillip Marlowe in Savannah even though he’s supposed to be in LA. Who knew? 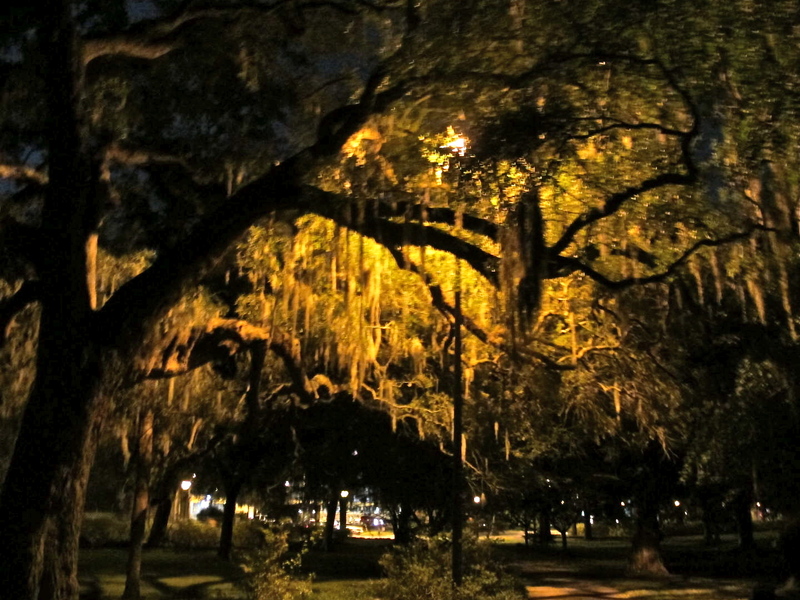 Spanish moss is all over the place in Savannah. Pretty to look at but not nice to take home in your car. Jerri says there are many bugs in the stuff. The Spanish moss hanging from the trees really intrigued me and I took way too many pictures of it. But it seemed so photogenic, eerie and spooky! This picture was taken on our ghost tour, which made it all the more eerie. Forsyth Fountain features mermen in lieu of mermaids! 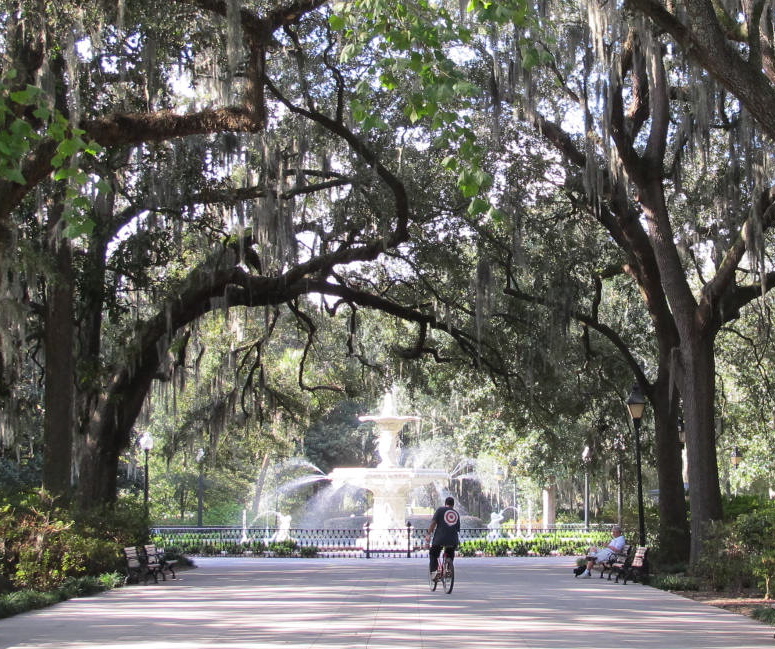 used Forsyth Park. Its popularity today is reflected in the fact that many weddings take place there as well as many other special occasions. I can’t remember its entire history, but suffice to say that it is very old – 1858. We learned on our ghost tour that at the peak of a yellow fever plague, a tunnel was dug from the nearby Candler Hospital to an area under the fountain where a large morgue was set up. It seems that the city fathers didn’t want the populace to know how many people had died of the fever. I looked it up and this appears to be a true statement. We also toured the Sorrell-Weed House just a few blocks from Forsyth Park and found it pretty neat too. As most places in historic Savannah, it’s supposed to be haunted because the wife of the owner flung herself off a balcony upon learning of her husband’s infidelity. We didn’t see any ghosts or any orbs. Dang! It would be so cool and scary to do so. All during our trip, Jerri had been pointing out street names, towns and what not that were named for someone of historical significance in Georgia history. I was impressed that she knew so much because she was in Georgia only 2 years while Allan was in the military. 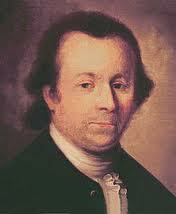 She had mentioned a guy named Button Gwinnett, who, it turns out, was a signer of the U.S. Declaration of Independence and wrote the first draft of the Georgia constitution. (Another aside here from Wikipedia: Studies usually suggest an example of an original Gwinnett signature would be valued only behind the likes of Julius Caesar and William Shakespeare, making Gwinnett’s, by far, the most valuable American autograph. Its extraordinarily high value is a result of a combination of the desire by many top collectors to acquire a complete set of autographs by all 56 signers of the U.S. Declaration of Independence, and the extreme rarity of the Gwinnett signature; there are 51 known examples, since Gwinnett was fairly obscure prior to signing the Declaration and died shortly afterward.) 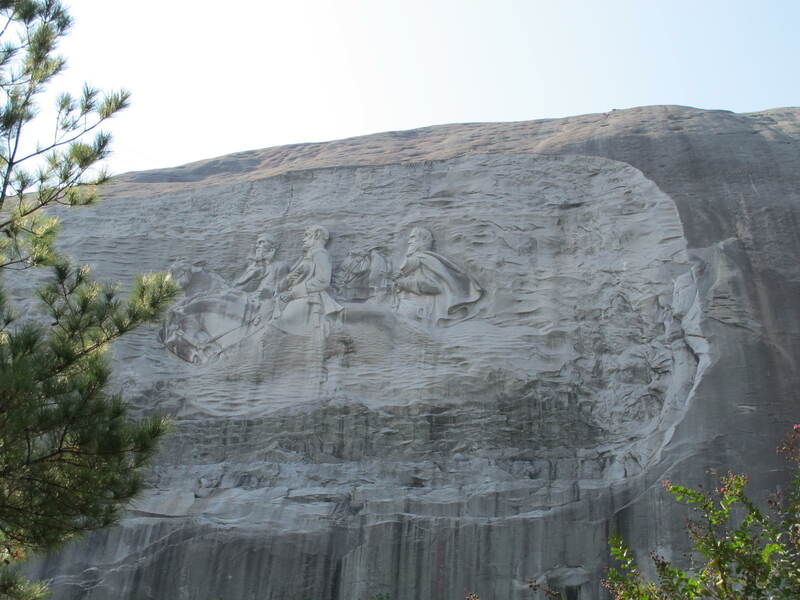 So he was an important and prosperous dude in Georgia and many things are named after him. While we were on our long walk on Bull Street, we crossed W. Gwinnett Street. I asked Jerri if Gwinnett’s name was William and was his nickname Button…whereupon she went into hysterical laughter saying that his real name was Button and the W. was for West! She did not let me forget that faux pas for the rest of the trip. Believe me, we saw many more references to Mr. Gwinnett while on our adventure and much laughter ensued after each sighting. After many recalculations with the GPS, we spent part of that morning at the large Bonaventure Cemetery, a former plantation that overlooks the pretty Wilmington River. I don’t know what happened to the plantation but it has been a cemetery since the mid-19th century. 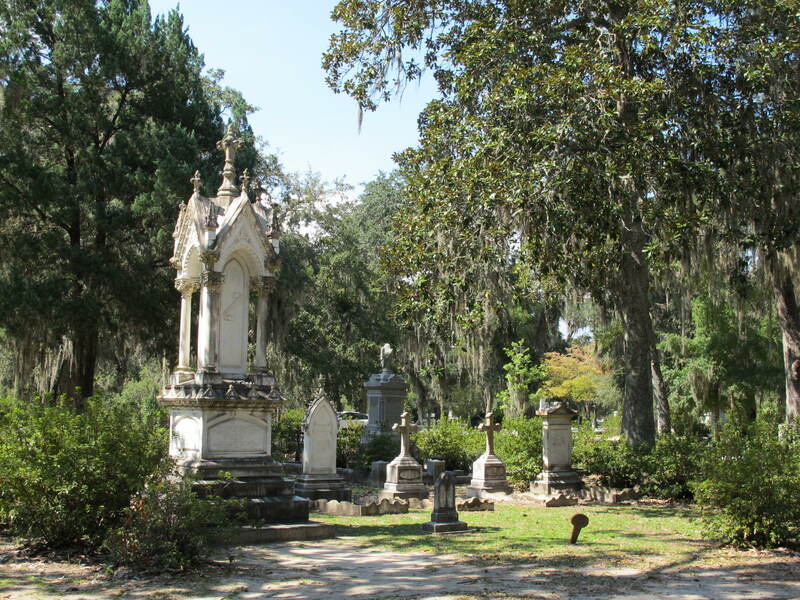 With really old live oaks, a lot of Spanish moss and many of the graves incorporating beautiful statues and ornate carvings, this place was eerie even in the daytime. I think I would have been too scared to take a ghost tour there at night. I’m sure we would have seen lots of orbs or even ghostly presentations on such a tour. I took a lot of pictures here but none convey the spookiness I felt there. Jerri and I both would not have wanted to be a woman wearing the regular 8 layers of black widow’s weeds during the 1800s. We probably would have swooned from the heat and humidity. It was hot enough wearing our contemporary togs. Savannah River. I thought it was a pretty neat edifice with its own moat, a cool drawbridge and 7 foot thick brick walls. But I learned that while it was formidable in the time it was built, it marked a turning point in military history. Union forces on nearby Tybee Island used rifled cannons and bombarded Pulaski, ruining one of its sides. The 1862 battle clearly demonstrated the power, range and accuracy of rifled cannon and signaled the end of masonry fortifications. We had an excellent tour guide who took us around to the cannon galleries and explained how the cannons were moved, loaded and how cannon balls were heated and shot at the enemy. (They shot red-hot cannon balls at ships in the river in hopes of setting them on fire.) 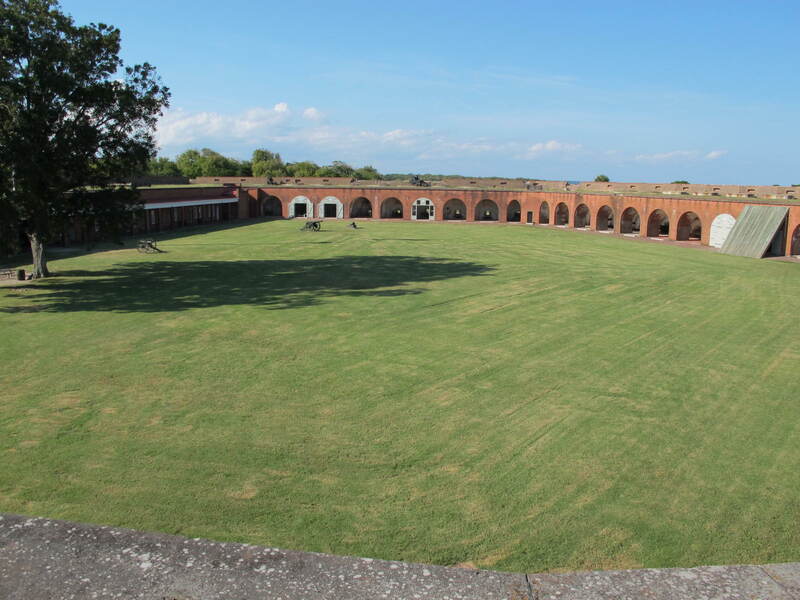 The fort is very well preserved and one can get an idea of how things were done during the Civil War in a fort such as this. 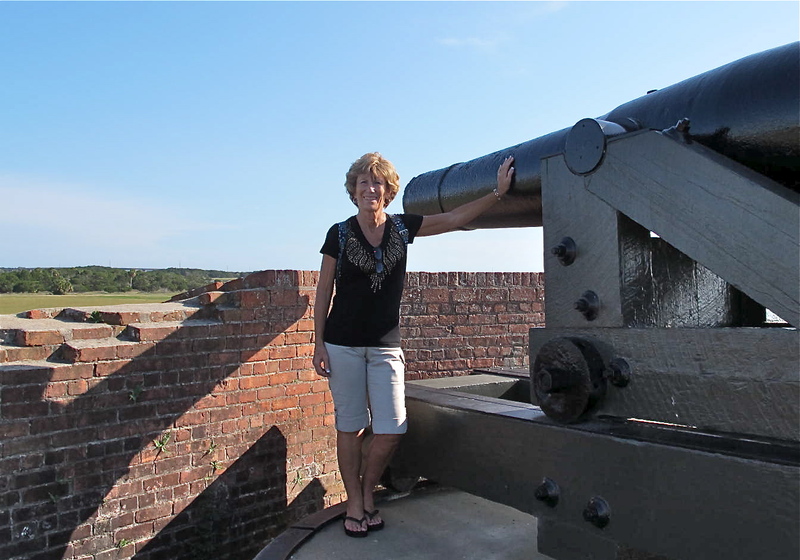 This next picture is a duplicate of one taken 40 years ago when Jerri and Allan visited Fort Pulaski. had been and are different from the OC…so rural, lots of trees, a few cotton fields and some swampy land with many trees. 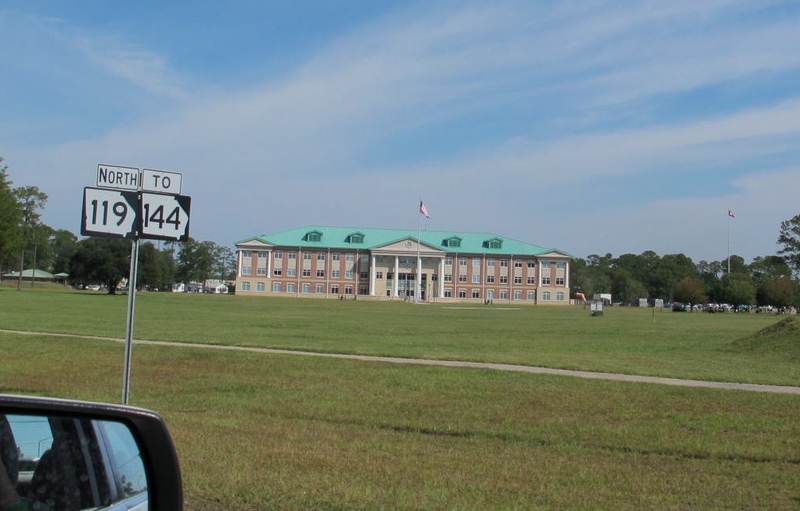 Even though we couldn’t find their place in Hinesville, we were able to drive onto Ft. Stewart and saw many changes there. This picture is of the headquarters, which was a big white building in 1972. We also visited Fort McAllister, a Confederate earthwork fortification, on a bank of the Great Ogeechee River. It was interesting to see how the earth was pushed around to protect the personnel as well as allowing the cannons a way to shoot at the enemy. The soldiers also used pointed stakes pounded at an angle into the ground around the fort for extra protection. 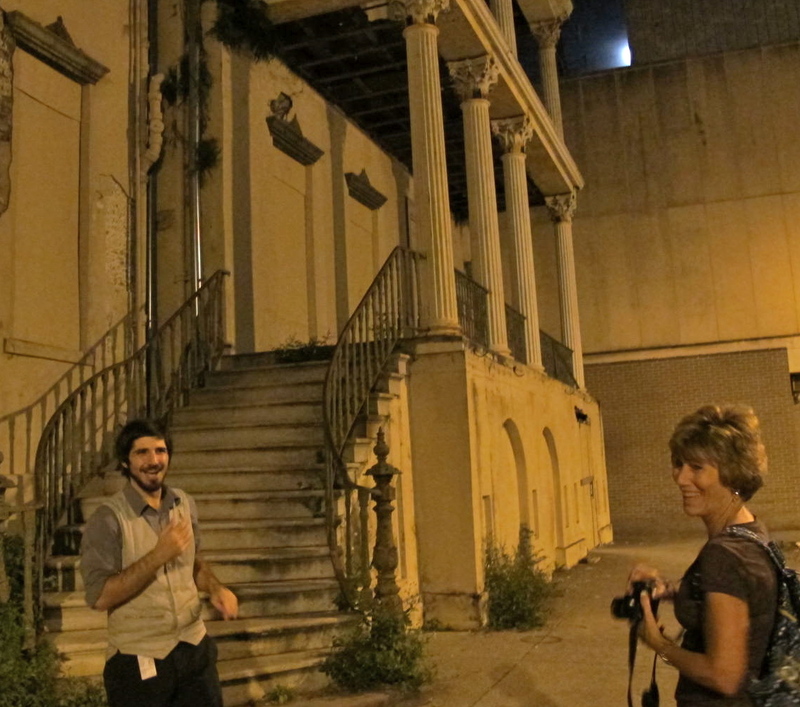 As soon as we got to Savannah, we scheduled a ghost tour in anticipation of seeing the city at its haunted best. Needless to say, we were sorely disappointed when it was canceled as we’d rearranged our schedule to meet theirs. We found another company, booked with them and then discovered it was the one I had originally wanted to go with. I had erred with the name of the company. So all worked out well. No orbs at the Candler. What a bummer. Christopher Thomas was our guide and he was excellent in creating the mood and telling the stories of Savannah and the buildings we visited. 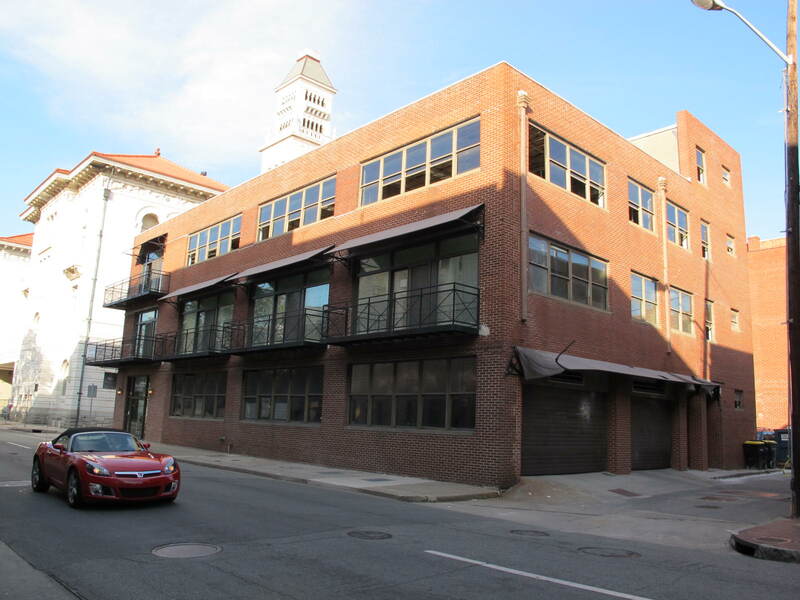 From Christopher, we learned that many of the people who lived on Jones Street were well-to-do and were often trend setters. People wanted to be like them and thus, the saying arose, “Keeping up with the Joneses.” We learned many stories that night, too many to recount here, but suffice to say, we were well entertained. 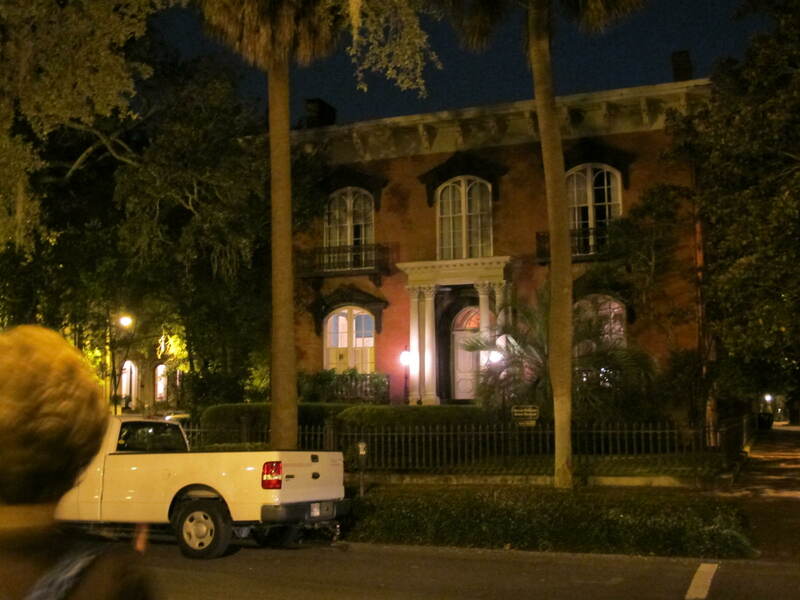 We visited the Mercer-Williams house where events central to the book Midnight in the Garden of Good and Evil took place. 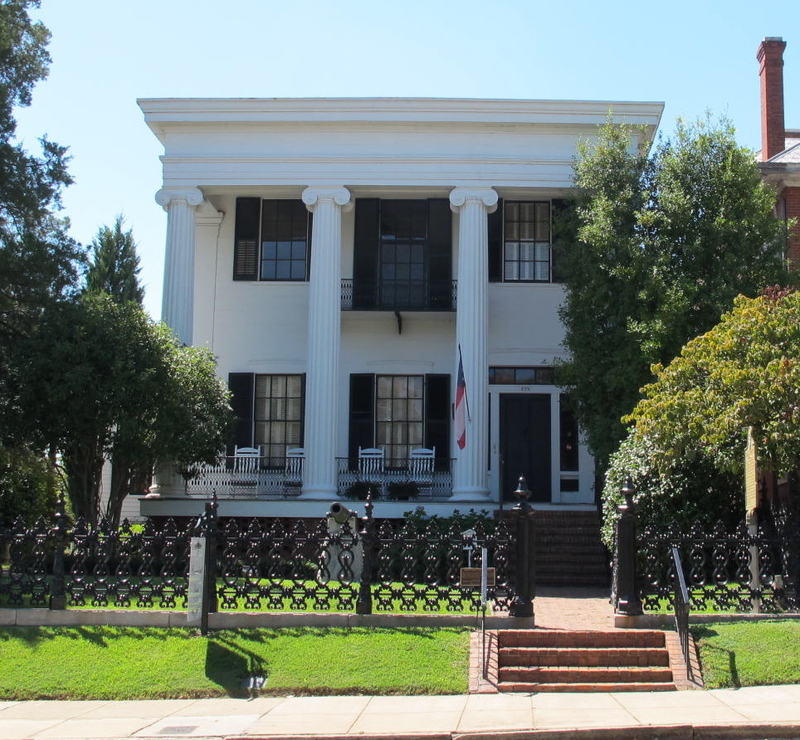 This 1860 mansion was built for Gen. Hugh w. Mercer, great-grandfather of singer and songwriter, Johnny Mercer. When we decided to go to Georgia, Jerri really wanted to eat at Paula Deen’s restaurant, but when we went by it, there was a line ‘clear ‘round the block of folks waiting to get in. She said forget it. She had more important things to do than wait in line. 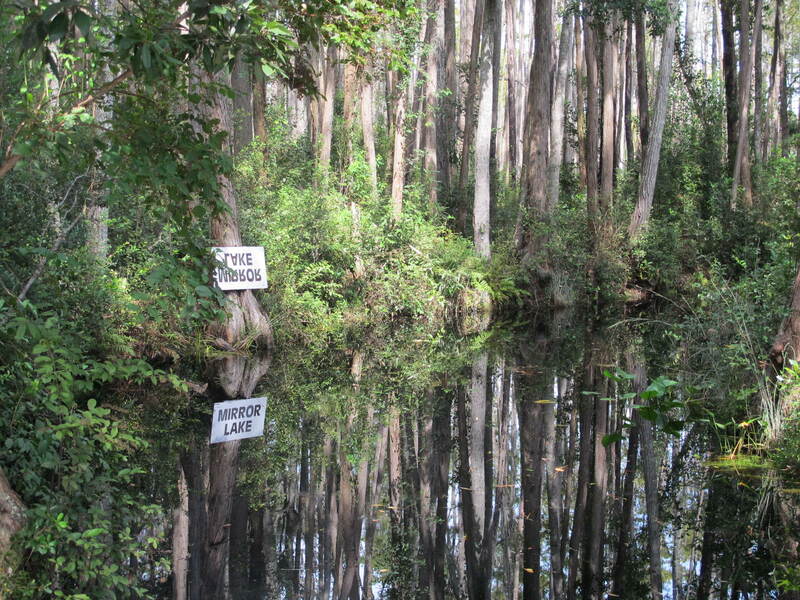 The morning after the ghost walk, we drove on down the road to the Okefenokee Swamp. What a fun place! However, it’s another area that I wouldn’t like to be alone at night. Creatures and critters were all over the place. Oddly enough, mosquitoes don’ t live in the swamp because they don’t like the tannic acid in the water (it looks like very strong tea). Jerri found that there were other biting bugs, though, as she got bit on her legs and feet. We took a little train ride and then a boat ride through part of the swamp. We saw many plants that the Cherokee and Creek Indians used for medicine and general living as well as trees used for lumber and also some ‘gators. 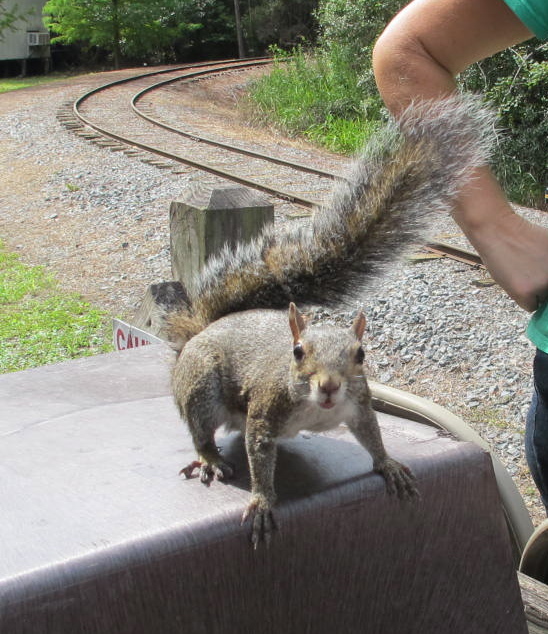 We met little Georgia, a squirrel, that met our train and posed for pictures before she bounced off with the train engineer to get some pecans for treats. 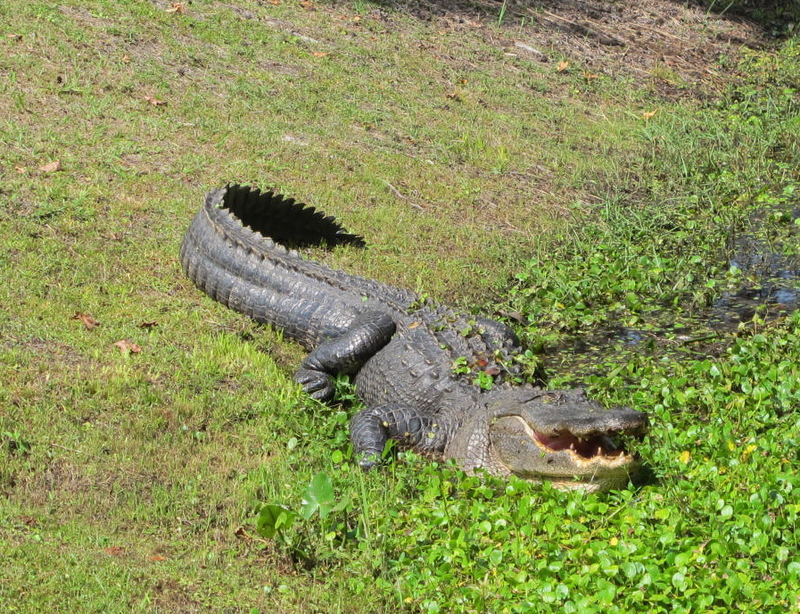 This is one of the big guys who was running around wild in the swamp. Don’t want to mess with him. 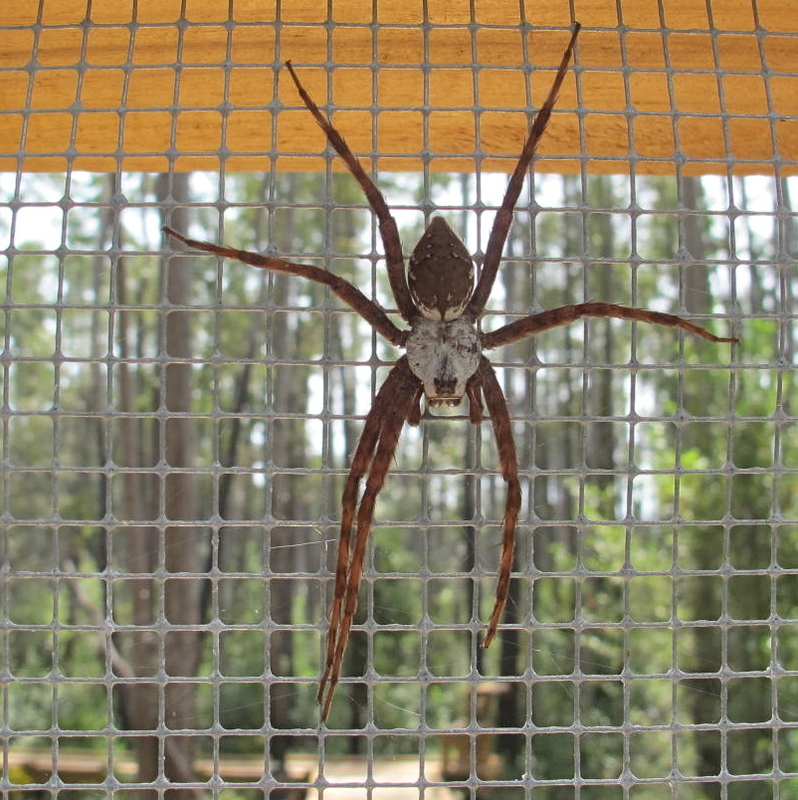 This 7 legged spider measured at least 3 maybe 4 inches. I would not have liked to walk into its web. Eewww! Mirror Lake was so reflective and pretty. We headed to a little town named Americus after the swamp. The highway was pretty and lined with many trees and then Glenda (the GPS) directed us to turn off on a little byway of a road. We thought that was strange, but Georgia doesn’t have particularly good signage, plus the ones they do have are small in print. Even glasses don’t help. Anyway, we zoomed on going over small hill and dale and did get to see a large deer bounding across the road. After about twenty miles, we came back to the original highway and then went straight to our hotel. Bizarre, but if we hadn’t taken that road, we wouldn’t have seen the deer (although I must admit that I was getting a tad nervous after 20 minutes of the beautiful road we were on). The clerk at the hotel said that misdirection happens all the time. Must be a glitch in the system. Our hotel was called the Windsor and is called the crown jewel of Southwest Georgia. 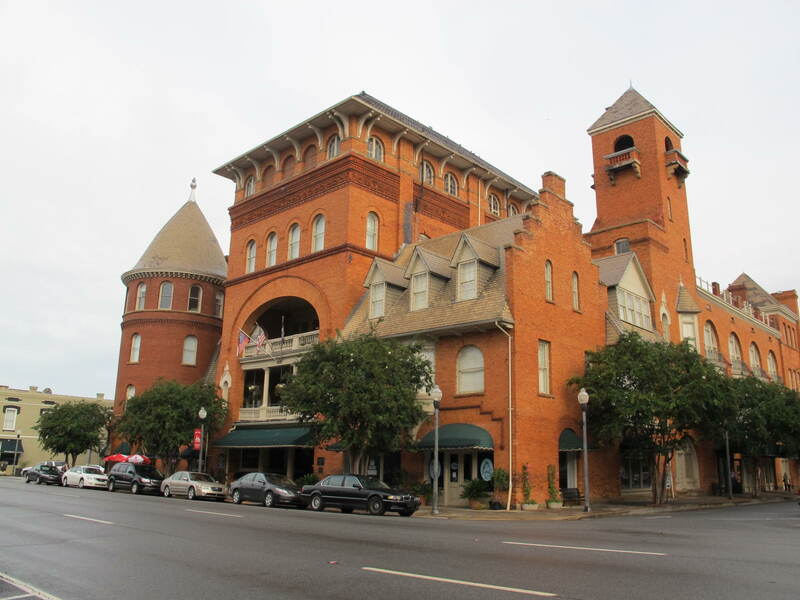 It was built in 1892 and even had a tower, a turret and a three-story atrium-lobby with balconies. It was gorgeous and all for $103 per night! It even had a pub in which we ate our dinner and an upstairs porch complete with rocking chairs that we sat in after dinner. Couldn’t ask for more. President and Mrs. Carter presided at the grand re-opening in 2010 and we reaped the benefits of that remodeling. We loved the hotel (which is also supposed to be haunted, but we missed the ghost). Jimmy Carter is big in this part of Georgia and we decided to visit Plains, which was just a few miles from Americus. We recalculated a few times(due to missing some signs) before we arrived in Plains , grand population of 779. The entire downtown is pictured below. Billy Carter’s Gas Station is a stone’s throw across the railroad tracks. Plains has a very nice Jimmy Carter Museum that is housed in the old high school he and Rosylynn attended. 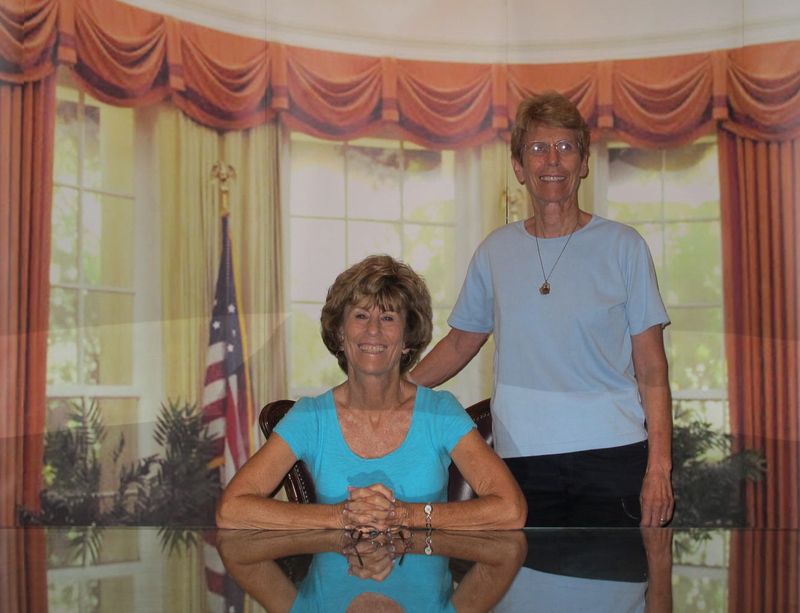 There is a replica of his presidential desk in the Oval Office and Jerri and I took full advantage of it, playing with multiple exposures of delayed picture taking or whatever that function is called on the camera. For a few seconds we were the Prez. The ranger must have been laughing at us while we were playing around with the photos. The Plain Peanut (where we saw a sign they served peanut butter ice cream…and after all it is Plains, GA, sort of a peanut capital) was closed when we got there and so we drove on out to Jimmy’s boyhood farm to see what is there. 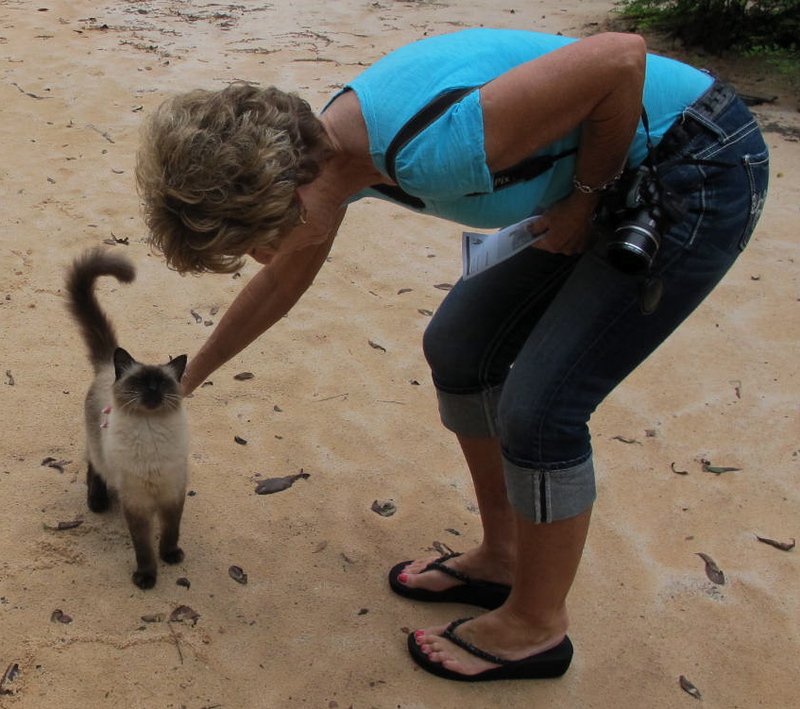 We encountered no one else but an extremely friendly Siamese cat who just wanted to be skritched and get lots of attention. He was obviously well cared for and we couldn’t figure out where he came from. Perhaps he just liked tourists and enjoyed being the host. 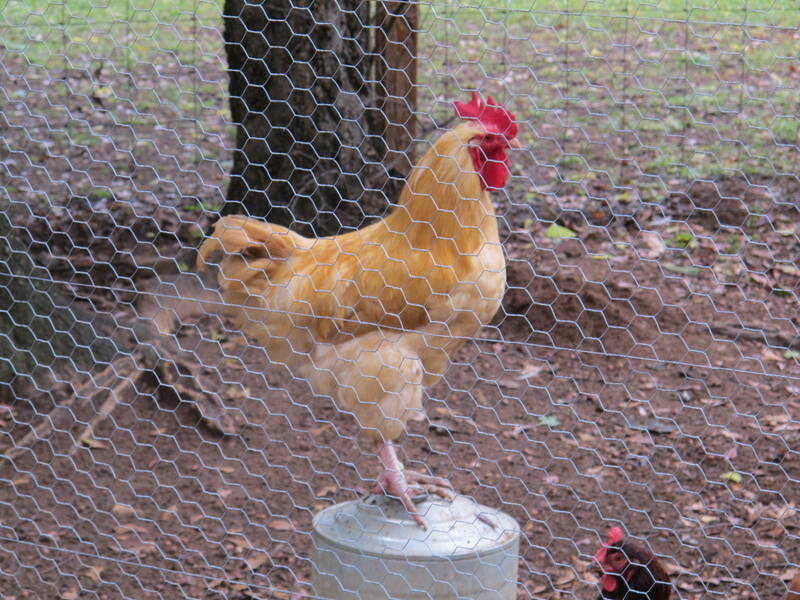 We toured Jimmy’s farm house and the grounds and got some good pictures of a good looking rooster. You could tell he was king of the ol’ bucket. I hope he wasn’t destined to be in the bucket soon. We buzzed back to downtown Plains to the Plain Peanut and enjoyed the ice cream, lots of different peanuts and some good conversation with the proprietress. I think she sold us a lot more peanuts with her down home hospitality than she would have by just saying “hi” as we entered the store. It was a fun lunch. 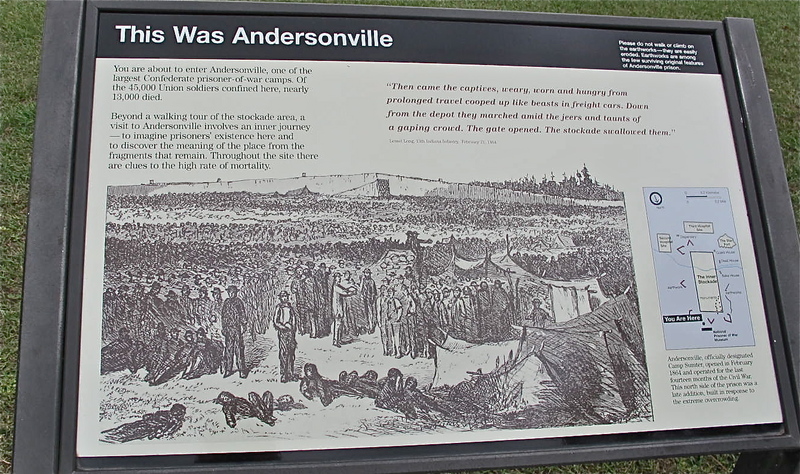 From there, we went to Andersonville (aka Camp Sumter), the scourge of prison camps during the Civil War. The beauty of the place today belies the hell on earth that it was almost 150 years ago. In the space of about 26 ½ acres, more than 45,000 Union soldiers were confined here, 13,000 of who died from disease, poor sanitation, malnutrition, overcrowding or exposure. These terrible conditions were the result of the Confederate government being handicapped by a deteriorating economy, inadequate transportation and the need to concentrate all available resources on its army. The prisoners lost out. Andersonville was not a pretty place during its existence. It started to rain and then pour while we were there so our pictures did not turn out as well as we would have liked. It’s neat and green and beautiful today, not giving much hint of what happened there (except for signs and some examples of the stockade and deadline) in just 14 months. The National Prisoner of War Museum is also housed on those grounds and provides insight of POWs’ ordeals throughout the nation’s history. Our visit there was tempered by the solemnity of the site, but buoyed up a bit with its beauty. Stately Oaks was arrayed with mourning shrouds due to the death of a prominent volunteer. zoomed through some real byways to finally arrive at Stately Oaks plantation in Jonesboro, a small suburb of Atlanta. Even though it was not the “ideal” plantation, this turned out to be a real treat! 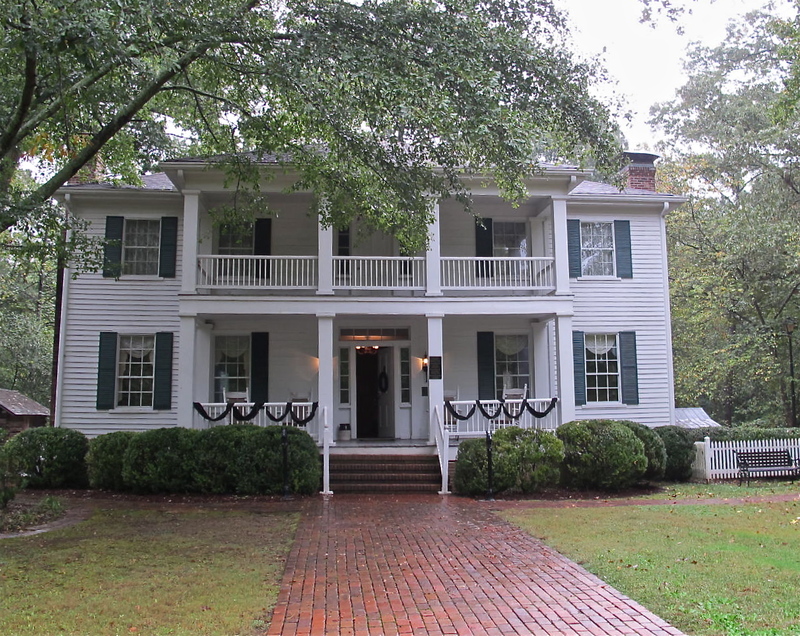 It is an 1839 Greek Revival plantation house furnished with antiques of the antebellum era with out buildings that include a tenant house, a small school, a well house and the original log kitchen. The tour was very interesting and we found that while Union soldiers were in and around the area and there were battles fought in Jonesboro, Stately Oaks was not destroyed. Then we found that Margaret Mitchell’s grandfather or perhaps great-grandfather built the place. She visted there often and asked many questions about the war and what happened while the war was going on. It is widely assumed that Mitchell used Stately Oaks as the inspiration for her famous Tara Plantation in Gone with the Wind. Jerri and I always marvel at how things turn out and we often get to see totally cool places/people by happenstance. We zipped through Atlanta to Kennesaw Mountain, another important Civil War battlefield. Some very bloody battles were fought for these high points that provided good views for the soldiers and also gun emplacements. This was basically the last major obstacle that Sherman had to defeat before putting Atlanta under siege. The visitor center provided an informative orientation film and also small exhibit area that really gave some good info about the battles and people in the area. 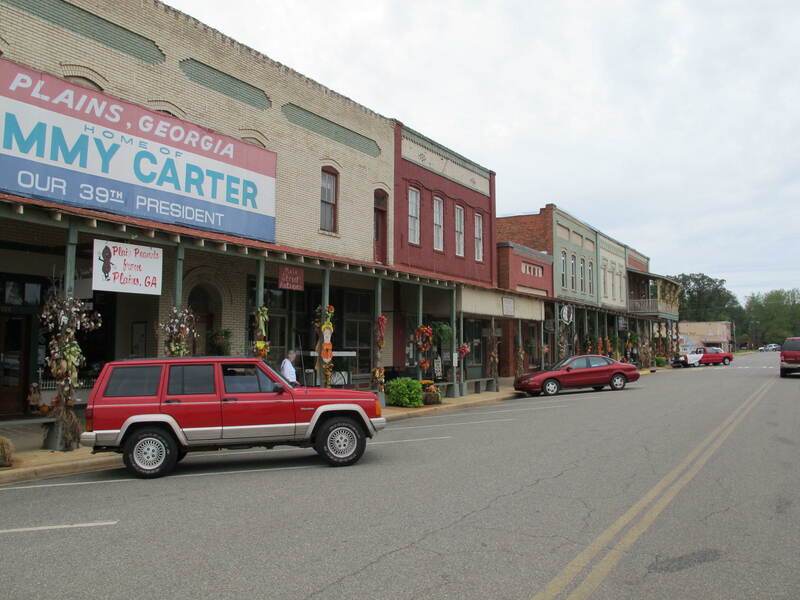 Since it was raining cats and dogs, we wound our way around some more byways and found Marietta, a town that more well-to-do folks moved to prior to the Civil War seeking the healthier climate of Piedmont Georgia during the summer malaria season. It was a pretty town surrounded by small hills. We toured the Marietta Museum of History and saw several galleries documenting the history of Marietta and Cobb County. They even had on display an old machine that would give perms to ladies (from the 30s). I thought it looked like an electric Medusa designed to electrocute the unfortunate lady. It was a pretty thorough display of local odd and ends. A picture of The General during a commemorative trip. We also made time to visit the Southern Museum of Civil War and Locomotive History in the town of Kennesaw. This is a Smithsonian affiliate that focuses on the history of Georgia railroads during and after the Civil War and has some great exhibits. 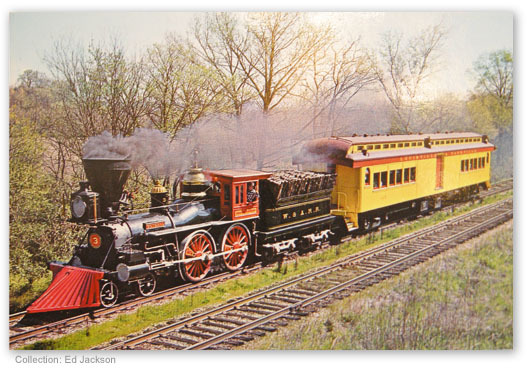 Several of the exhibits tell the story of “The General” which was stolen during an incident known as “The Great Locomotive Chase.” You may have seen the movies made by Buster Keaton in 1926 and Fess Parker in the ‘50s of the same name. It is quite a story and lends itself to a movie very well. The real General is right there in that museum. It was fun to see. The rain caused us to wind our way around again and again due to crummy street signs and misunderstandings with local instructions and/or Glenda, but we eventually arrived at our hotel and then to a recommended restaurant. The next morning was still damp, but we went back to Kennesaw Mountain to get to the lookout to see what was supposed to be a great view. And it was! 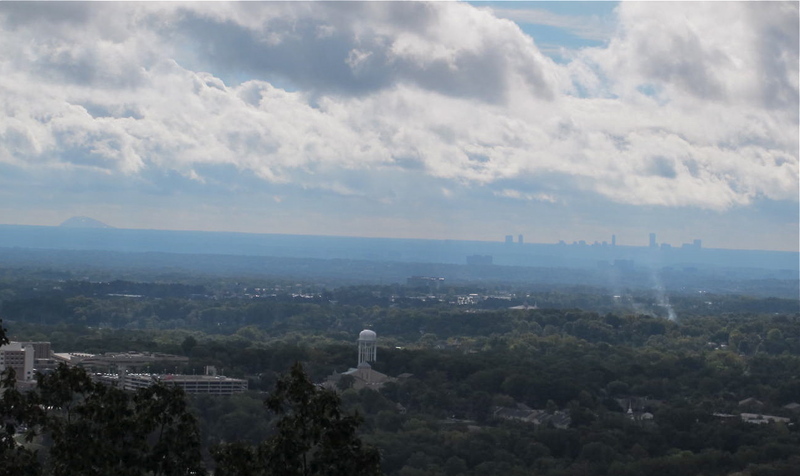 Despite there still being clouds in the area, we could see Stone Mountain and Atlanta, both more than 20 miles away. That was pretty exciting for a Southern California kid. Stone Mountain is the bump on the left and Atlanta is the skyline on the right. Not real clear, but one could still see almost 30 miles in the distance. 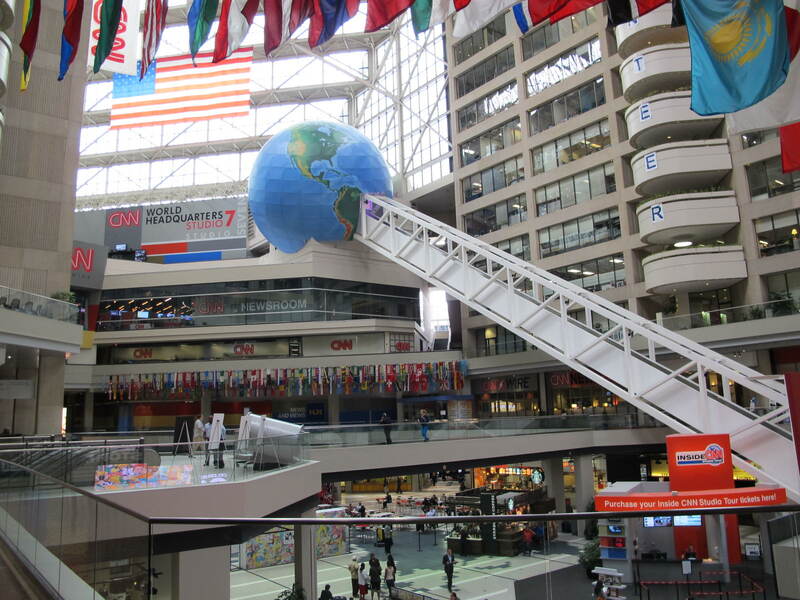 Since the weather was iffy and we’d about done enough Civil War stuff, we decided to spend our last afternoon in Atlanta at the World of Coke and the CNN office building. I wasn’t real excited about driving in Atlanta, given the trouble we’d had with street signs and all, but we managed to home in to the correct parking structure and have a great afternoon. The World of Coke was very well done and a lot of fun, but I think I was tired and thought parts of it were too loud. 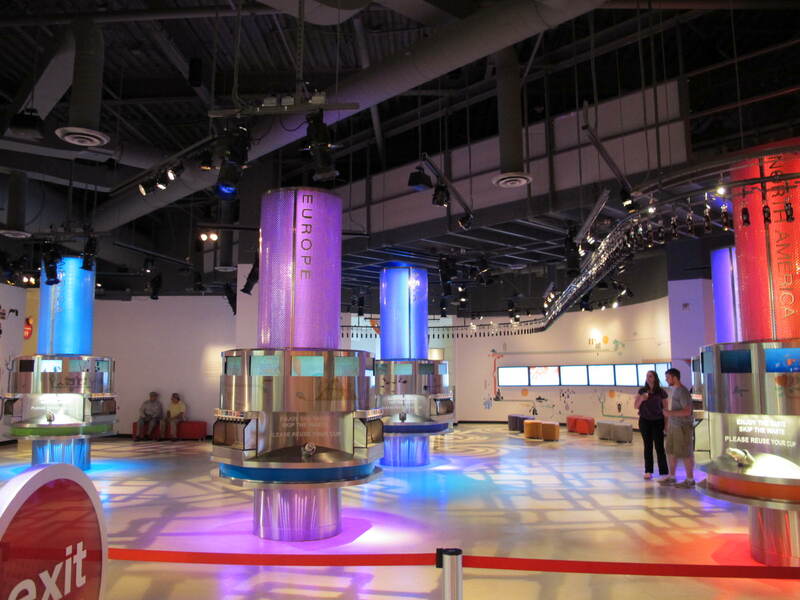 We went through assorted “rooms” and learned the history of Coke, how it began and how the company evolved into what it is today. One of the rooms had a lot of commercials for Coke from all over the world. How weird it is to enjoy watching commercials? 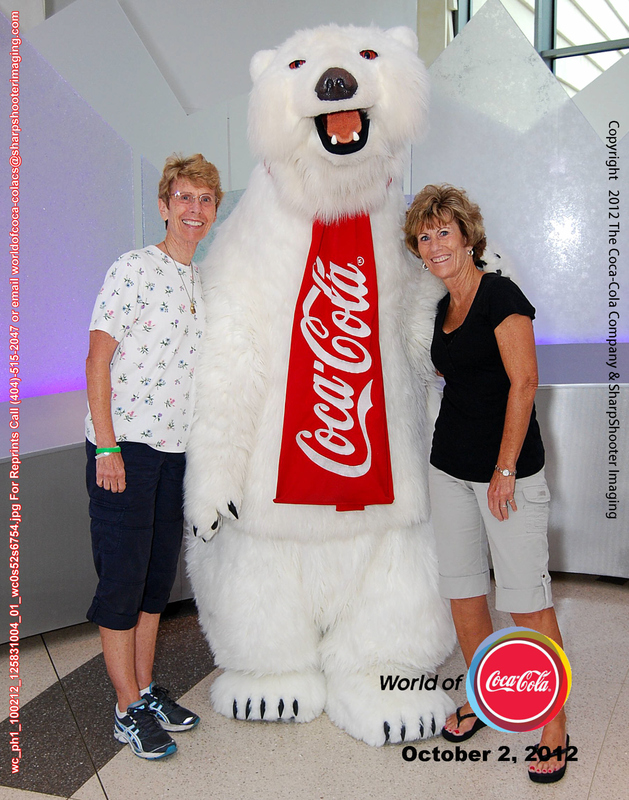 But one of my favorites is the one where a lot of people from around the world sing “I’d like to Buy the World a Coke…” We got to take our picture with the Coke polar bear and also with Mr. Pemberton, the guy who invented Coke. One of the rooms had a ton of memorabilia from around the world as well as specific Coke bottles from Nevada and California. We both got to hold an Olympic torch from the 1996 Atlanta games. It was a lot heavier than I had expected and I don’t think I could have run with it very far in the torch relay. 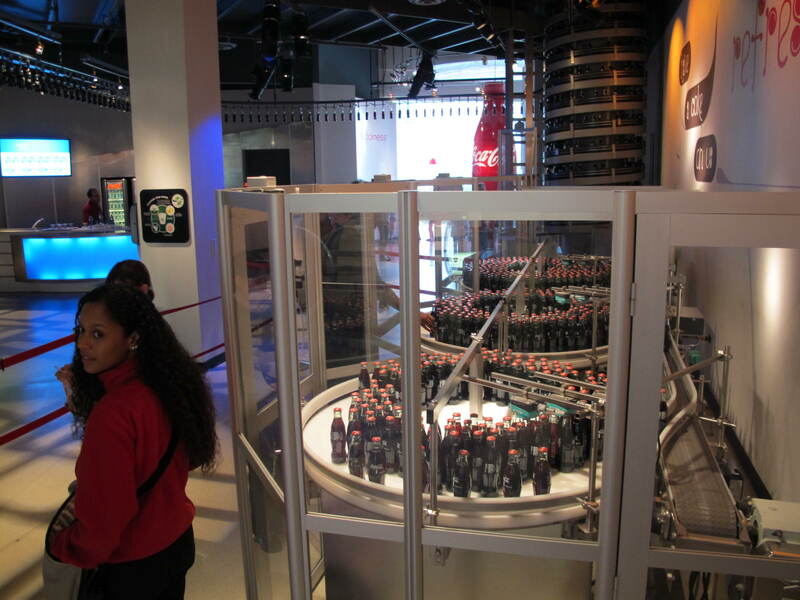 There was a small bottling room so that we could see basic process of how Coke gets into bottles. The bottles went out on a conveyor of sorts into the tasting room. The pentultimate room was a tasting room that was sectioned off into continents. There were 64 Coke products from the various continents and we could taste as many or few as we wished. There was no Coke as that formula is the same around the world, but other flavors were available. Some were too sweet, too bitter and none seemed just right. (I sound like Goldilocks, huh?) Funny thing about the tasting room picture. There were people milling about, tasting, discussing and tasting again and I happened to get a picture without many people in the view. But you get the idea of how the room was divided into continents. If you will notice a sort of curved line or illuminated line along the right side, that is the bottle carrier from the bottling room. The bottles were quickly deposited into 3 turntables where we could pick up a free bottle of Coke. The very last room was, of course, the gift shop. Anything you could possibly think of with a Coke logo was available with the appropriate price tag. One could go nuts in there. While walking toward the World of Coke, we could see a Coke bottle on one of the towers. This picture depicts about half of the 8 story escalator. Jerri and I had our news anchor picture taken in the globe at the top. Jerri and I left the World of Coke and walked about 2 blocks through the Olympic Park to the CNN building. This is a cool place to visit to see how a mega company like Ted Turner’s works. Our tour began riding up the longest escalator in the world…8 stories worth up into a sort of hollowed out large building. This picture is only a portion of the escalator which ended in the blue globe at the top. 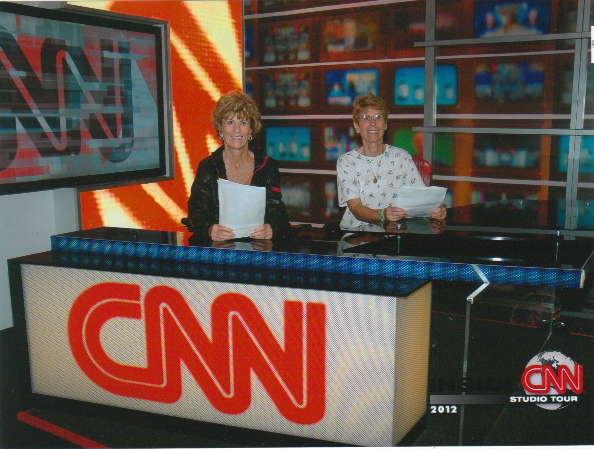 There, Jerri and I got our picture taken auditioning to become news anchors. Luckily, we didn’t quit our day jobs. I got to try reading from a teleprompter and found that it wasn’t very easy, especially when our tour guide sped up the teleprompter. We took a ton of pictures as we learned about the news process from beginning to end in that building. It is certainly impressive and I’m glad that I don’t have that job. Too much pressure, I think. We walked back through Olympic Park to our car and then programmed Glenda to get us to our hotel. It was quitting time in Atlanta and the traffic was building. But we managed to arrive without too much hassle. It was when we tried to go out to dinner that we had a problem. Around and around the mulberry bush we went trying to find this place. Finally, we had to admit defeat and go back to the hotel and try for more instructions. How embarrassing! I think I mentioned before that Glenda doesn’t work without an address and we didn’t have one, plus I couldn’t find the place in a phone book because I was spelling it wrong. Good thing it was a good dinner! Then the next morning was a challenge to get the car back to the rental company. We thought we had an address, but it was the corporate office near the airport and since it was dark we didn’t see anyone to ask for help…PLUS the danged signs either weren’t present or they weren’t clear or they were too small and we missed them. Finally, after backtracking, we finally arrived, turned in the car and made our way to the Southwest terminal. The Atlanta airport is cool to get from the car rental area to the terminal…just hop a little train and off you go. No, we didn’t manage to mess that up! 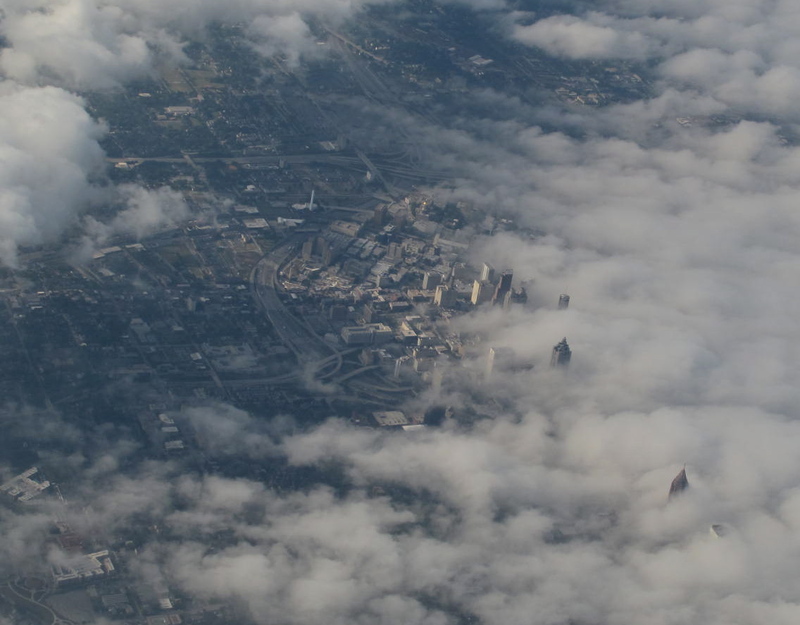 The clouds were breaking up over Atlanta when we left and the sight was neat with the tall buildings breaking through the clouds. Our trip was fun, educational in many ways for me, and FUN! Jerri is so much fun to travel with and she makes me laugh (and I think, I make her laugh, too) and that makes the trip even more better. Thank you, Queenie, for being my sister!